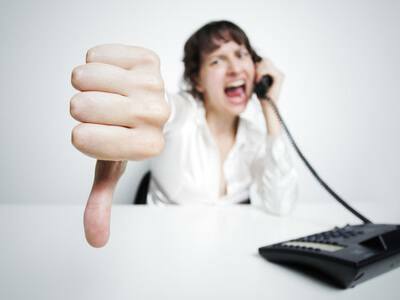 Bad service is made of bad agent-customer interactions. Research shows that the quality of interactions with customer service staff is a key factor influencing customer satisfaction, customer loyalty and therefore purchase decisions. See the infographics linked below for a summary of results from a number of customer service research studies. 1. Quality of interactions: 40% of consumers cited the quality of interactions with customer service reps as an important factor influencing their purchase decision. 73% dropped a brand because of incompetent staff. 2. Speed of response: Just over 50% of consumers give businesses just one chance to respond to a support query. You often have just one chance to get it right. 3. Negative experience bias: As everyone in media knows, people prefer to tell and hear bad news. Consumers tend to tell far more people about bad service experiences than about good customer service. Also the majority of people will not tell a company directly about their bad experiences: a business learns about only 4% of dissatisfied customers. This means that you don’t find out fast enough to do anything and the news of the bad spreads faster than what you do well. This is not just about whether your customers get warm and fluffy experiences – bad customer service is costing companies big: Across 16 major economies in the world, the estimated cost to business of poor customer experience is a whopping $330 billion. The good news is that it has never been easier or more cost effective to create end-to-end customer service processes. Right now, a small or medium-sized company can deploy solutions quickly and cheaply that only a few years ago were accessible only to corporate enterprises. Most importantly, you can now join up your services across channels and measure all elements that impact your service. So there is no excuse for poor customer service! Helpscout: Bad Customer Service Infographic and Salesforce Desk: Bad customer service – It will cost you.